With the recently released British biopic Stan & Ollie making its domestic theatrical debut, the beloved timeless comedic duo Stan Laurel and Oliver Hardy have enjoyed a resurgence of renewed public interest with many of their most celebrated comedies quickly making their way to blu-ray for the first time on the heels of this new movie. Just recently, a 3-disc blu-ray set entitled The Very Best of Laurel & Hardy was released in the United Kingdom as the United States marketplace is also busy at bringing the comedy team’s filmography to home video in the best possible condition. 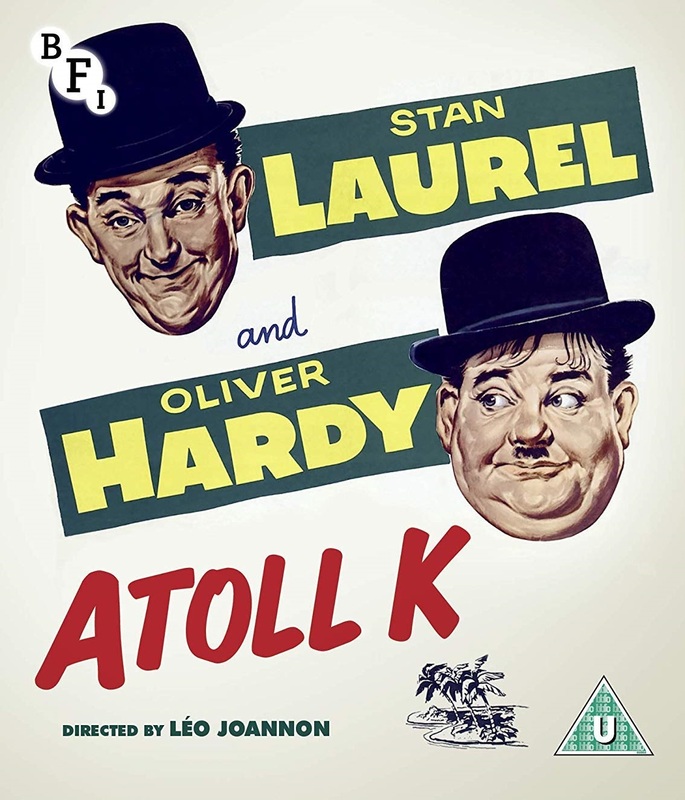 Which makes the British Film Institute’s definitive 2K digital restoration of Laurel and Hardy’s final film together Atoll K, the messy, immensely troubled and largely derided French-Italian coproduction something of a footnote strictly for die hard fans only keen on seeing what their final shared onscreen appearance looked like. Given the widespread library of films that are still among the funniest in slapstick comedy history Laurel and Hardy left behind, that the British Film Institute sought to give arguably their worst film the deluxe edition treatment seems like an odd choice but I digress. After separating from Hal Roach studios and a failed picture deal with 20th Century Fox and Metro-Goldwyn-Mayer, Laurel and Hardy began touring on stage throughout Europe when their films which found waning returns in the United States became increasingly popular with postwar European audiences. 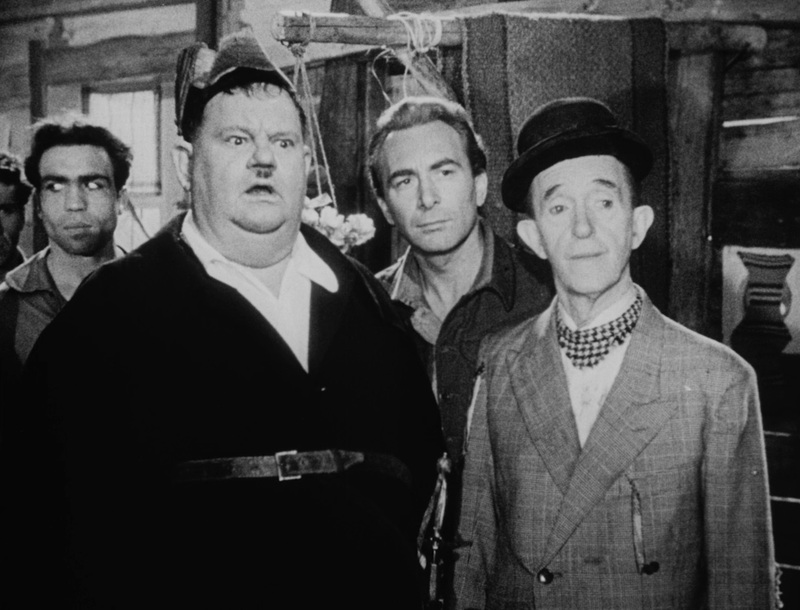 Mid-tour, the comedy team was offered a substantial sum from the French-Italian producers to make a film to be produced and shot in France for roughly $1.5 million. Laurel and Hardy accepted the offer and traveled to France in the spring of 1950 with the intention of shooting for three months. 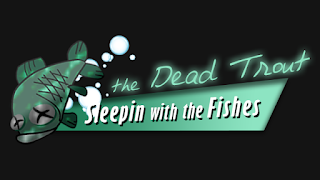 As with the plot itself concerning the comedy team working to save their Pacific Island inheritance via a slipshod yacht, a series of insurmountable problems befell Laurel and Hardy almost immediately. Upon arrival on set, there was no screenplay and the team of French writers on location coupled with language barriers didn’t seem to understand the comedy team’s style of humor. Moreover, the film’s hired helmer Léo Joannon fell out of favor with Stan Laurel and he was forced to sneak in blacklisted US director John Berry uncredited to finish the film. To make matters worse, both actors fell ill mid-shoot with Laurel looking sickly and emaciated onscreen before having to undergo surgery and Hardy experiencing cardiac arrest on the set, grinding the production to a halt for months on end. Initially slated for three months, the production expanded to almost a year and soon as a rough cut began being assembled, it became clear to the producers and distributors Atoll K was not going to be a very good film. 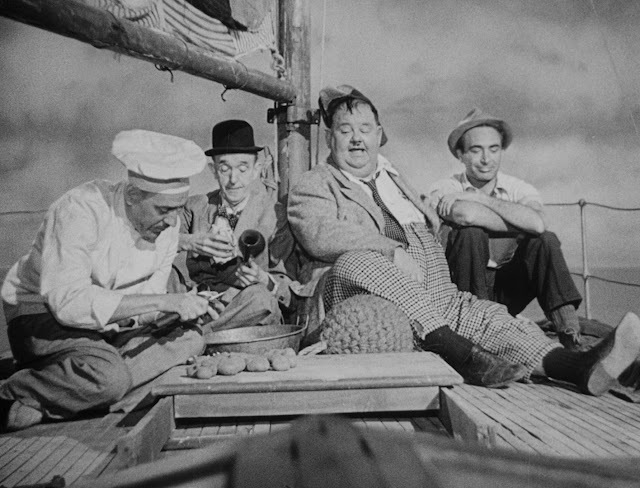 For instance, there’s a subplot involving French singer Suzy Delair who amid feuding with her fiancée takes refuge in Laurel and Hardy’s hut with plans to establish the island as a new republic. Typically Laurel and Hardy find themselves caught up in a quasi-romantic triangle involving the affections of a lady, but in this case Delair’s scenes completely grind the film to a halt and actually diffuse the comedic potential of the dynamic duo’s scenes. This may well in fact be the only instance I can recall a Laurel and Hardy film emerging as a largely disappointing and unfunny mess. While I always love seeing the slapstick antics of Stan & Ollie onscreen, watching Atoll K (or Utopia or Robinson Crusoeland depending on the territory) was kind of depressing to watch. Sometimes the infectious charm of the two still comes through onscreen with some gags managing to elicit laughs, but mostly Stan & Ollie look frail and worn out in this. And even if they weren’t suffering from failing health and aging, the film itself never came together in a form anyone could agree upon. Worst of all, it simply just isn’t all that funny or entertaining. For years this fell into public domain and as such was the most widely viewed Laurel and Hardy film, which in and of itself is very sad. Newcomers to Stan & Ollie are inclined to avoid this one as it has the potential to ward the uninitiated off from further viewing of their far more celebrated comedy classics. As it stands, it’s an interesting end and for completists the last time you’ll ever seen Laurel & Hardy onscreen together. No isn’t quite as bad as everyone makes it out to be, but it is indeed telling that Mr. Laurel himself vowed to never watch the film.